Storey Publishing, LLC, 9781603427258, 320pp. Make sleek and functional home furnishings from inexpensive plywood and other off-the-shelf materials using only basic hand and power tools. This unique building guide offers 73 innovative ideas for using plywood to make everything from desks and workstations to children’s playhouses. Projects for every need and skill level are presented with clear assembly diagrams, step-by-step instructions, and photos of the finished product. Discover the simplistic beauty plywood can bring to your next project and take pride in making your own handmade furniture. Philip Schmidt has been teaching readers how to do things for almost two decades. A former carpenter and longtime writer and editor, he is the author of 18 books, including PlyDesign, Decorating with Architectural Details, and The Complete Guide to Treehouses. He lives in Colorado with his wife, two daughters, and too many leftover building materials. 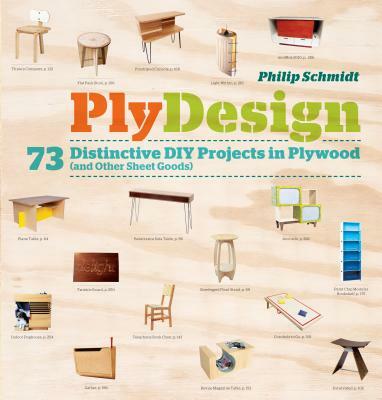 “PlyDesign is how-to heaven … a great place to start for independent creators desiring to dive into ply world." "PlyDesign offers all sorts of ideas for way-cool things to make from common sheet goods."